The Google Nexus 7 tablet is one hot little piece of gadgetry, the demand for which has been so ahead of the supply that third-party retailers and Google itself ran out of stock in a matter of days after the device's launch. It is as if everyone is out to get one of these affordable slates, kind of like what we witnessed when the Amazon Kindle Fire hit the market last year. 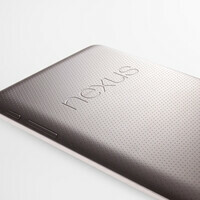 But just how many Google Nexus 7 tablets have been sold so far? We don't have any solid sales figures yet, but statistical data collected by Chitika shows that usage of the device is on the rise. In fact, if the momentum that Google's tablet is picking up persists, the Nexus 7 will likely become more popular than competitors like the Kindle Fire and Motorola XOOM before we know it. Chitika collects usage statistics based on advertisements displayed on mobile devices through its ad network. And according to the data obtained so far, there are 0.3 ad impressions on a Google Nexus 7 tablet for each 100 iPad impressions. Seems not all that much, we know, yet the figure is actually quite impressive, according to the company's analysts. After all, the device has been on the market for only about a week or so. 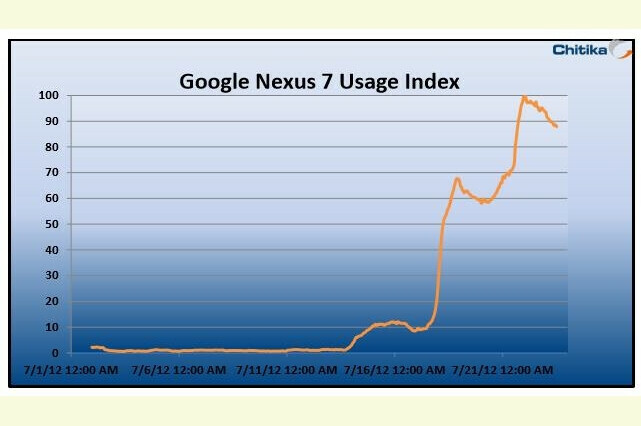 The Nexus 7 usage index would likely shoot even higher once Google catches up with demand. Of course, let us not forget that Apple and Amazon are both expected to announce new, affordable tablets of similar size. Therefore, the rise in Google Nexus 7 popularity might be short lived as users might prefer to see what the competition will introduce in the coming months before getting one. It will definitely become the best selling Android tablet. Google and Asus did a great job packing in high-end hardware for a low-end price. Where else can you get a Tegra 3 processor, HD screen and Jelly Bean for $200? This is the tablet I've been waiting for. The nexus phones never picked up because of its spec/price benefits. Have a look at the Galaxy Nexus, after one year its price is still around 400 USD, when with less than that you could buy the Samsung S II that have a better overall specs and might get the jelly bean in the future. Now the nexus 7 somehow fixed that, or at least is indicating what the next generation of android tablets will look like. You are missing the cost associated with the kickback for the carrier with your phone analogy. Nexus 7 is WiFi only and is not tied to anyone else looking for a hand out. pellegrini, the Nexus line is very popular for those that dont bide by contracts. its $350 straight up without subsidy through google play. And its always on the latest software. Put it on a cheap Tmobile prepaid line and you have a top end phone for pennies. Yea, the SGS2 might be cheaper on contract, but you pay thousands more for it in the end. Also, you have like a 50/50 chance of an official 4.1 SGS2 update. Samsung announced SGS3 updates without saying a word about the SGS2. Also, the tablet world is not the same. There are very few tablet subsidies out there to hide the actual price of the device. In tablet land, the Nexus is not only among the cheapest, but its also among the most powerful and better resolutions, and again, its the only one with direct updates that doesn't have an apple logo on it. So instead of a $350 unsubsidized product going up against $100-200 subsidized products, you have a $200 product going up against $500-600 products doing the same thing, only better. The only droid tablet better than the nexus 7 is the Transformer Prime TF700 and that would cost you more than 3 Nexus 7s. 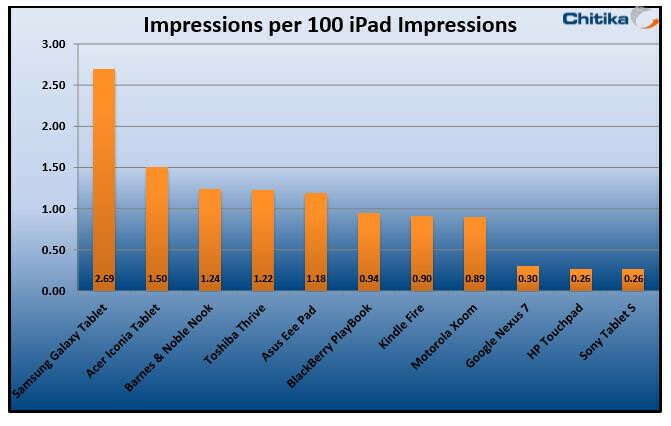 100 ipad impression vs 0.3 nexus 7 impression lolx... Good try but keep it up :) BTW i never thought rim playbook get so much impression O.O!! Haha Wendy you are such a troll. normally ur an iFan, but u Troll on both Android and iOs.... cults and §h¿ep$ will all-ways be dimwits. A fact and is the logic. Well considering it has more than the Kindle Fire, its probably attributed to that fact that the playbook has one of the best mobile web browsers out there (and unlike the Nexus 7 or Kindle Fire, supports Flash), and also its important to note that some apps/games that have a native app available on android do not on the playbook but are available via flash or HTML 5, we have to access through those means, so that drives browser traffic up some. Or in the case of a native app being complete trash (like Facebook), its usually much better just to go to the website. The android app gets crap from Phonearena ,but the Facebook android app is WAY, WAY better than the Playbook one, the Playbook one doesnt even have Timeline yet. Also, the Fire's browser is trash, Im sure users of that tablet avoid that browser whenever possible. Do they have a good alternative available on the app store? acer and toshiba are beating Asus... WHAT?! ?